This is the column I really didn’t want to write. I don’t believe in moralizing and punishing or frightening people into doing the right thing. So I don’t want to write that column about how bad climate change is, and how we really ought to be scared out of our wits and out of our cars. Then I spent a few days in Vancouver. British Columbia is the province where the Green Party is taken most seriously and where the environmental movement has been most active. This has translated into actual policy and planning for change. For example, Vancouver has made enormous progress in reducing car use in the city, where 50 per cent of all trips are made by other means. So it’s no surprise that it was in Vancouver that I had a long chat with a friend, as we walked the seawall in the rain, about governments and climate change. And it reminded me I needed to write this column about the urgency with which transportation policy should be designed to respond to climate change. With apologies, what follows is a bit of a sermon. For what it’s worth, it is primarily aimed at the party that truly deserves a metaphorical kick in the head for the stupidest, most destructive decision I’ve seen in quite a while: the Ontario government, for its decision to widen yet another stretch of the 401 from six to 12 lanes. The more we study and try to measure the extent and speed of climate change, the worse the news is. Climate change is happening faster than predicted. Global average air temperature is rising. The Arctic and Antarctic are both experiencing the lowest sea ice coverage ever documented. The oceans are warming faster than expected, and picking up speed. Glaciers are melting faster than expected, at rates never before observed, even and especially in places like Antarctica. This leads to rising seas: global sea levels rose about seven inches over the course of the 20th century alone. Warming waters are also contributing to the collapse of parts of the continent: for example, NASA believes a 10,000-year-old ice shelf that once spanned over 11,500 square kilometres will be gone by 2020. Oceans are warming because they are absorbing the vast majority of the world’s temperature increase. Oceans are also acidifying, as they absorb more carbon. These temperature and pH changes are affecting the viability of the ocean as a habitat. Carbon dioxide is a naturally occurring part of the atmosphere, but it needs to remain in balance with other elements. The NASA climatologist James Hansen established that to maintain civilization as we know it, the highest level of carbon in the atmosphere we should have is 350 parts per million. We passed 400 in 2015. Last week, we hit 410. Carbon dioxide emissions from human activity—the burning of fossil fuels—are responsible for the lion’s share of greenhouse gas emissions. 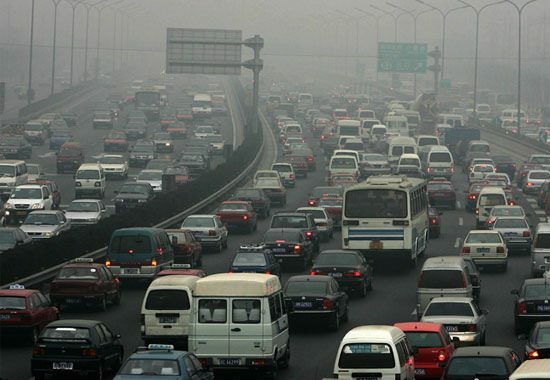 Transportation is the second-biggest source of fossil-fuel emissions, after energy production. Planes are the worst offenders. But half of transportation emissions come from private cars and trucks. Governments in North America, by and large, have not done anywhere near enough to try to reduce those numbers, and vehicle-miles-travelled have increased in both Canada and the United States. It’s important to remember that ecological time is not all slow-and-steady, but often a sudden-and-dramatic-break. It is not as simple as extrapolating from the current pace of change to figure out how many years we’ve got before we’re in danger. We want to avoid, if we can, the sudden catastrophic change that leaves us no time to adapt. We need to make serious reductions in our carbon emissions, and we needed to do it yesterday. The urgency of the situation is hard to exaggerate. Climate change is already happening, and more is inevitable. The poles are already warming. Permafrost is thawing, absorbing lakes and ponds into the ground and releasing large stores of methane, also a greenhouse gas. If we go too far, we lose our ability to grow food. Anywhere. In 2003, under the leadership of the same Liberal Party in charge right now, Ontario began a complete phase-out of coal-fired electricity. It was the first major political jurisdiction in North America to do so. The last coal plant closed in 2014, and the Province has passed legislation banning any further power generation from coal. This was one of the best things Ontario could have done. When it comes to carbon emissions from burning fossil fuels, coal is just about the worst for CO2 emissions and particle pollutants. (You can see its higher costs reflected in the B.C. carbon tax, for example, here). Getting rid of it makes a big difference. Coal was costing us big time. A 2005 study put the annual health, financial, and environmental costs at $4.4 billion. When the Canadian government talks about its progress lowering its emissions nationally in the early 21st century, it’s almost entirely due to Ontario’s decision to end coal. I’ve always thought that the Province did not make a big enough deal about it. Yet now, this same governing party has decided to expand the 401. They’re spending $81 million on that one project. They claim it will reduce congestion, in the face of overwhelming evidence that it will do no such thing; it will only increase the number of cars on the road. So, why do this? Part of it concerns the geography of Ontario trade: many goods still move by truck and those networks remain poorly co-ordinated (if you really want to dig into that, check out the work of my colleagues Roger Keil and Doug Young here). Widening highways provides at least the appearance of action on improving goods delivery. This is also about geography in another way: the Liberal Party holds seats predominantly in suburban areas of large urban areas in southern Ontario. Those are communities that depend on cars, which the premier acknowledged in her announcement. Residents often have little-to-no choice, given the distances between homes and shops or workplaces, and the insufficient provision of alternate modes of transit. Often, roads lack even a paved sidewalk. Preserving the mobility of suburban residents must revolve around improving the design of their neighbourhoods and improving transit accessibility, not increasing the accommodation of cars. Every time any politician says anything like “we have to help drivers,” they have it wrong. Suicidally wrong. We have to think about how to efficiently move millions of people, not individuals—and not cars. We have to do this in a way that has the smallest impact on the environment. The answer is not one-at-a-time, in a big, fuel-guzzling box. The answer cannot be building more residences at ever-greater distances from all the places they need to go. We need to care just as much about time in a car at top speed as we do about time in a car in traffic congestion. We are spending billions of dollars to erode our quality of life and that of everyone else on the planet. It is criminal. Or, at least it should be. Transit buses can have less than one-fifth the emissions per passenger as private cars. Electric rail has zero emissions (and no indirect emissions, assuming the power source isn’t coal). Every walk or ride on a bicycle saves us money, not only due to zero carbon emissions but also from the improved health of the pedestrian or cyclist. Every “high-occupancy toll” lane where you can pay more to go faster should be a “high-occupancy vehicle” lane where you need to take extra passengers to get that advantage. Every penny budgeted to maintain the Gardiner “hybrid” should be spent on transit. Every penny allocated to expanding highways should be spent on regional rail and renewable energy. We must invest in transit and active forms of transportation (walking, cycling). We also need to stop investing in the use of private automobiles. I know it sounds melodramatic, but our very well-being, perhaps even our existence, depends upon it.